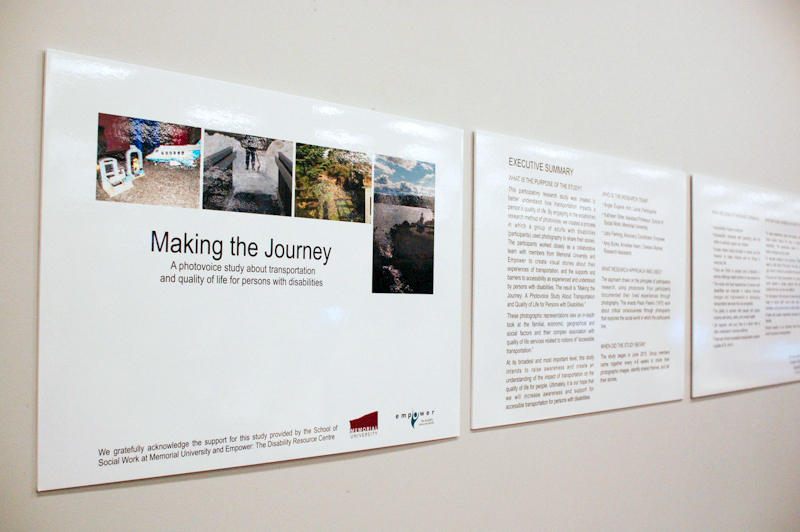 This past Friday, I attended the opening of "Making the Journey: A Photovoice Study About Transportation and Quality of Life for Persons with Disabilities". 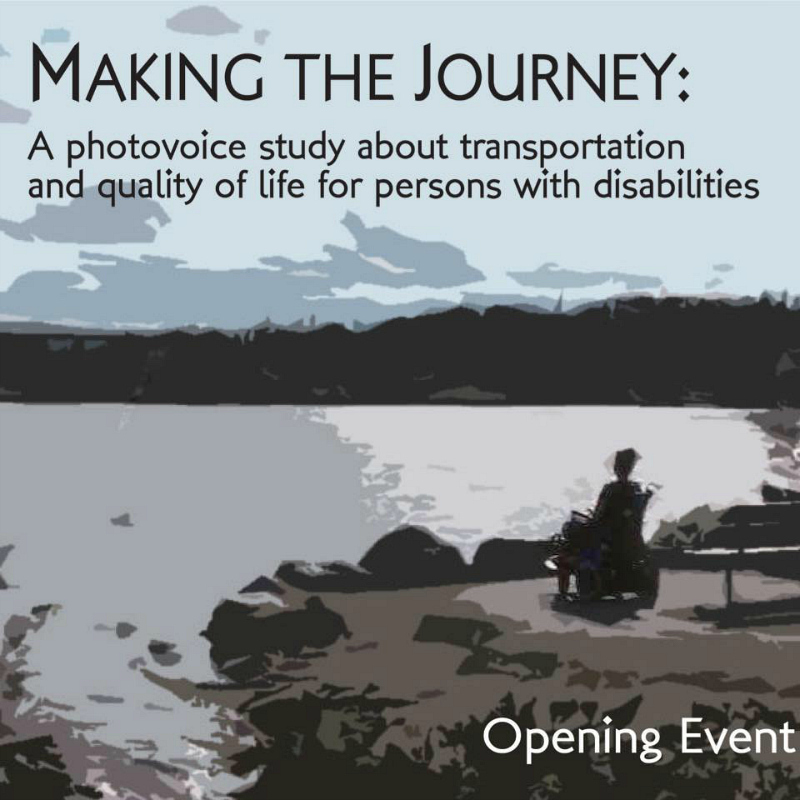 Making the Journey features the photography of a group of adults with disabilities who came together over 12 months to explore the social impact of transportation on their lives through photos and personal narratives. 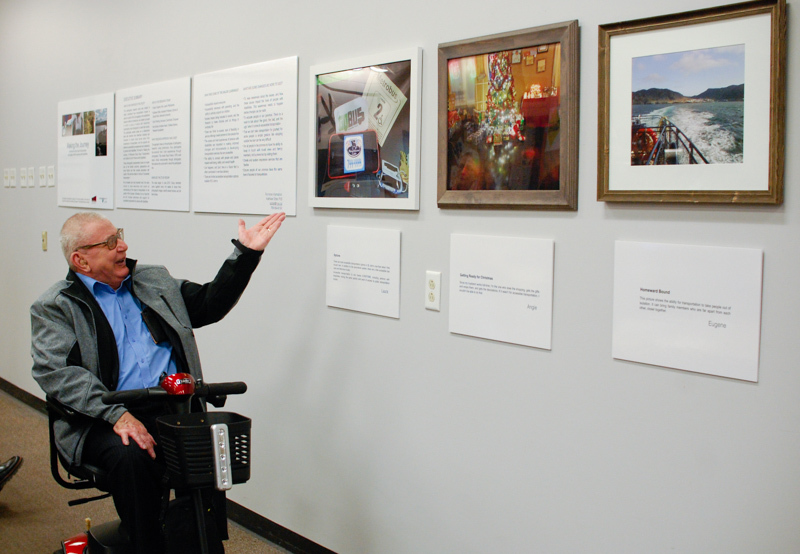 Dr. Kathleen Sitter, lead researcher, and assistant professor with the School of Social Work, hopes the exhibit will encourage a discussion about transportation issues for persons with disabilities and engage policy and decision makers to mobilize to bring about change. 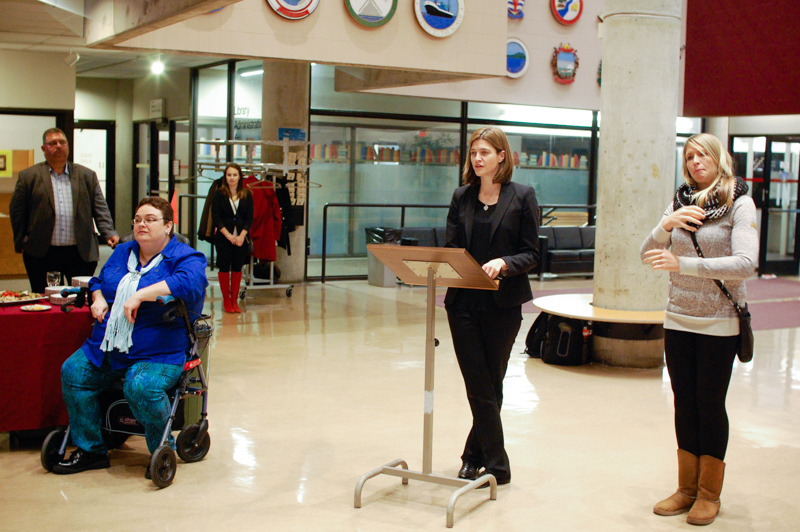 "Accessibility is a growing area of focus across Canada," she said. "It has a huge impact on our ability to participate in society. Transportation is particularly important, because it touches on so many aspects that connect to a person's quality of life. 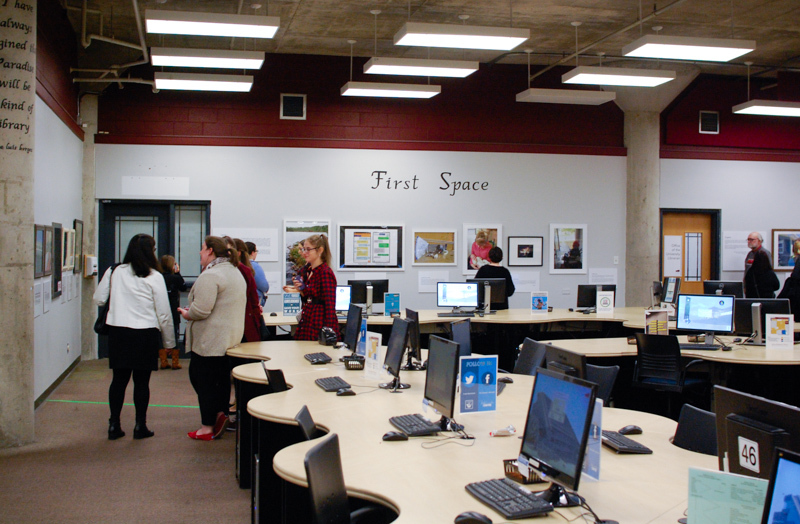 This exhibit highlights the stories of our community through photography." The participants worked closely as a collaborative team with members from Memorial University and Empower, the Disability Resource Centre to create visual stories about their experiences of transportation, and the supports and barriers to accessibility as experienced and understood by persons with disabilities. "It's very important that persons with disabilities' viewpoints and experiences are captured through this photovoice," explained Kimberly Dawson, Executive Director of Empower. "It's been a great partnership and a wonderful opportunity." "I am originally from rural Newfoundland but moved to St. John's in 2005 to attend university. I am a wheelchair user. For most of my St. John's life, I relied on using the para-transit system. It was my only transportation option, and a restricting and sometimes quite frustrating one at that. There is and always was a high demand for the para-transit system, making it difficult to book rides and causing long wait times for a bus. In 2013, I was able to get my own accessible van, which gave me so much freedom. I was no longer restricted by the para-transit's strained system, hours of operation, and geographic limitations. My transportation options increased more in 2015 when the City of St. John's introduced a few accessible Metrobus routes and taxi cabs. One reason I got involved in this photovoice project is because transportation is an important part of a person's quality of life. Not everyone has their own personal vehicle, but everyone should have the same options and level of access to public transportation modes. 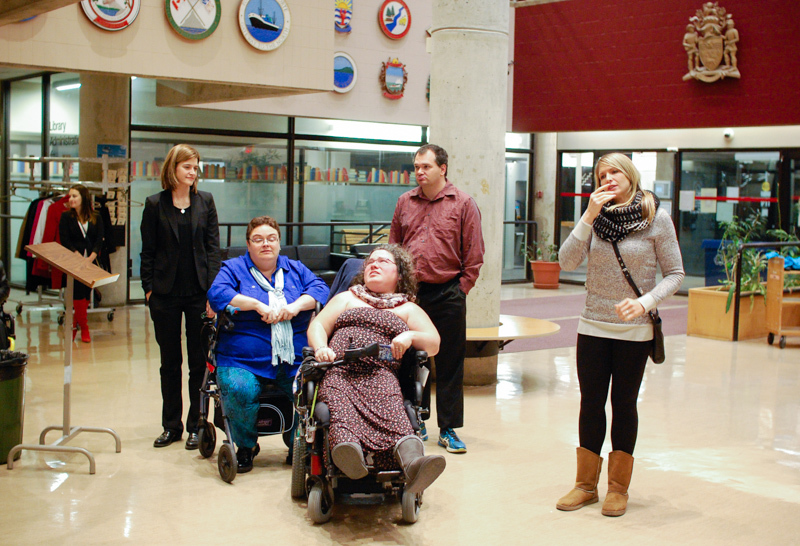 I am hoping that this photovoice project helps create awareness around the importance of transportation for persons with disabilities, and how restricted accessible transportation options are throughout Newfoundland and Labrador." 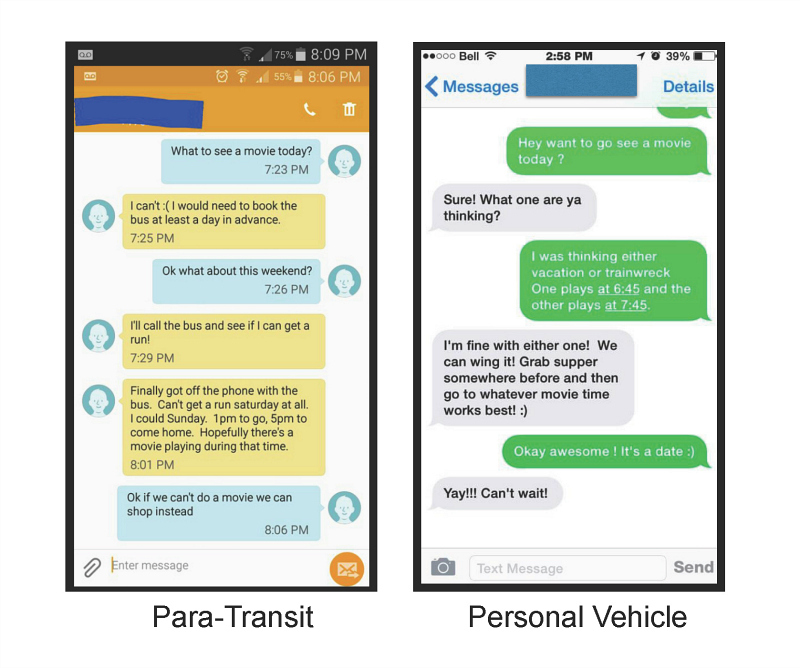 Laura shared an example of what a conversation might look like between her and a friend, both when she had to rely on the para-transit system, and now having her own personal vehicle. And this photo is titled "A Waiting Game". Laura says, "When I used the para-transit system, I spent a lot of time waiting. I cannot speak personally as to what the system is like now, but I have heard from current para-transit users that things have not changed much. I spent a lot of time waiting by my door for the bus. Waiting and wondering; being anxious and frustrated. I had to be ready 15 minutes prior to my requested booking time, but sometimes would still be waiting 30 minutes past my requested time. Sitting... waiting... contemplating: should I go back inside? Should I keep my hat on? Will I be late for class? Is the bus even on its way?" "Having transportation that is accessible has given me more independence and freedom to do things in daily life. 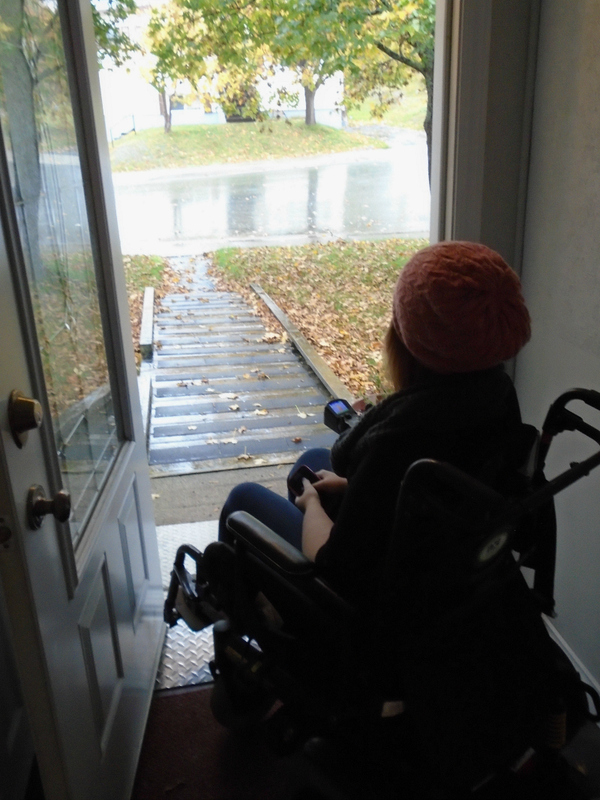 Accessibility means being able to go to places where everything is in reach, that I can access places and buildings without having barriers like stairs, elevators, or narrow doorways. Accessibility means I can be included in events, and not be left out. I am able to go visit family or go to events in the community. I am included. I can come and go in a safe environment without hurting myself and endangering my safety or my health. I know how important it is to plan ahead and make sure I have transportation and where I am going is accessible and I have a safe way home as well. I decided to be involved in this project because I wanted people to know how important accessible transportation is to me and to so many people, and how it makes a difference. Otherwise, I would be isolated. Having transportation that is accessible has changed my life." This photo is titled "Access to the Outside World". Kim says, "This is a pathway of my house. I am not able to rely on family to do my snow clearing. I cannot physically do it myself, especially since my bowel surgery and recent cancer diagnosis. I also have hernias where I had surgery. 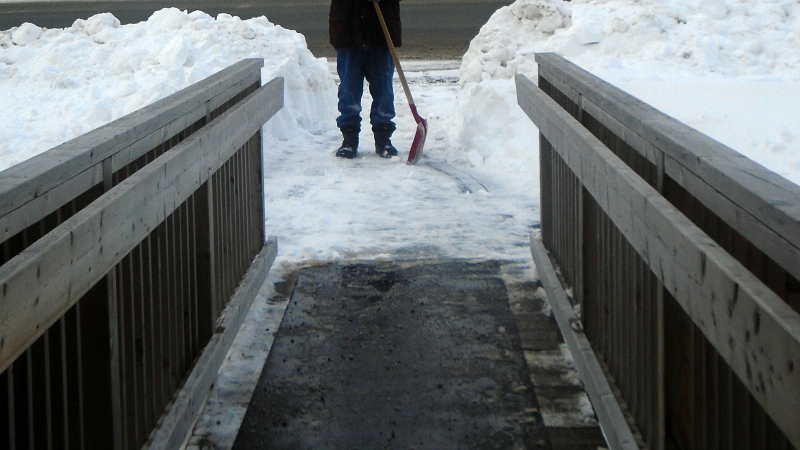 My home support workers are not supposed to do snow clearing, this is not part of their duties. So I have to rely on others for my access to everything. The snow is a big obstacle that causes a lot of anxiety if I can't get out to my medical appointments. I depend on the para-transit drivers to safely transport me from point A to point B and if the pathway is not clear and safe for them, I cannot get out. I cannot do my banking or grocery shopping. Otherwise I would have to give my home care workers my debit card and that has personal privacy issues." I have written about the value of accessible transportation before (see HERE). Transportation is about a lot more than just getting around. It is about connecting people with all of the things that make life worth living, like family, friends, education, health care, job opportunities and recreation. Providing equal access to affordable and reliable transportation widens opportunities and provides all individuals living in our communities with an equal opportunity to succeed. There is a lot of great work happening by a lot of great people, but we need to do more. We need to take it upon ourselves as community members to have strong values of inclusivity, to remove barriers and to liberate the potential of people with disabilities. We don't want this to be the end of the conversation. This needs to be a continual discussion and we should make this an opportunity to start meaningful dialogues about what can be done to ensure that everyone, regardless of ability, is able to participate fully where they live, work, and play. The 'Making the Journey' exhibit is taking place at the First Space Gallery in the Queen Elizabeth II Library, and runs until December 16th. You should go!